This LED compact projector is hugely versatile. Weighing just 460g you can take the portable ML330 virtually anywhere. Perfect for a movie marathon or gaming night - you can even use it as a business tool to deliver engaging presentations using Office and PDF viewer apps. Do you own the ML330? Write a review and let everyone know about your experience. There are no owner-added reviews for this product at the moment. "Perfect for any evening of entertaining or party." "Yes, she is obviously is a she because she’s gold (obviously I went with a gold projector). She’s so small and light that it makes the perfect portable projector, so wether you’re headed to your own garden or elsewhere, pop her i her carry case and off you go. The picture quality is insane for such a small thing"
"It certainly ticks all the boxes so it’s a big thumbs up from us, and as you can probably imagine, it’s going to get a lot of use, and indoors too in the colder months for sure!" The Optoma ML330 projector was only 122mm * 155mm in size and 460gm. In addition the picture so good…that it looks like we may have to add it to become yet another family member. I mean what could be better than sipping your favourite Summer drink, in your very own garden whilst watching your favourite Netflix show!!! In any case with built-in WiFi and running Android™(we connected our iPad ), all you really need is a power cable and the ML 330 projector. Then voila say hello to your home movie set up. The Optoma ML330 is certainly a fun, quality and affordable portable projector. Don’t be misdirected with its custom-built Android interface, this admirable piece of kit works with other smart devices to truly deliver an exceptional choice of device connectivity, with maximum entertainment for your family or friends. Utilising the WXGA DMD DL chip, the image of the Optoma ML330 display provides extra light through the pixels, giving you a nice clear picture. The display size can expand to 120inches, so whenever you’re having a FIFA tournament on Xbox One with your friends, or movie night with the family, you will find this and more is why we chose the Optoma ML330 for our number one spot. The Optoma ML330’s integrated WiFi means no unnecessary wires, fuss or leaving your phone out of reach while you put your feet up. Mirror your phone or tablet’s screen without the need for cables and use Bluetooth to hook up speakers, headphones, or even a keyboard and mouse. The ML330 had most everything I loved from the ML750st without the short throw lens, which meant that the colour, clarity, easy focusing, and brightness was all still there. The unit comes with stellar image quality, bountiful I/O and at a reasonable price. It’s small, but packs a punch, and is something I was more than a little sad to have to send back to Optoma. Not just for home entertainment, this can also be used as a tool for a school environment or office environment. Very user friendly. Everything is simple to use and just worked. Optoma’s line of projectors have always been synonymous with quality – and their newest ML330 projector surely didn’t disappoint. ML330’s lights are LED-based, and it is undeniably bright for a projector of this size. I hooked up the ML330 to my PC using HDMI and to an iPad using an HDMI to lightning adapter. It worked flawlessly on PC, showing accurate colours on various slides and other tasks that I did. Connecting it to an iPad the ML330 instantly turns into a portable cinema. Movies looked great, and while the resolution isn’t the best, it still effectively offered rich colours that made me enjoy what I’m watching. 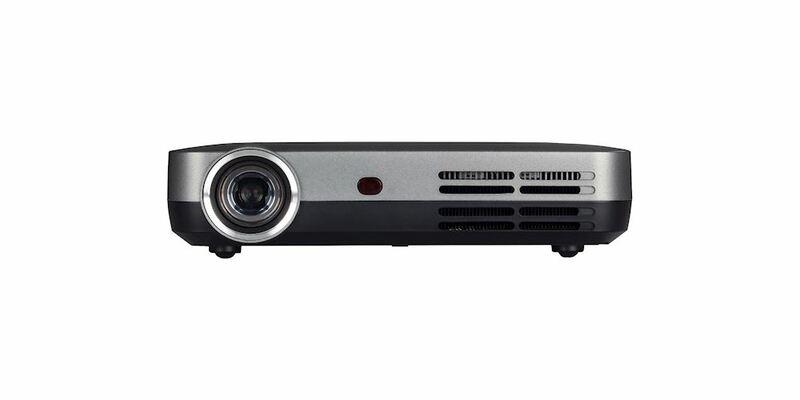 Overall the ML330 is a more than decent projector for the price. It can do a lot of things via it’s Android system or you can just plug in an HDMI cable to connect it to your Xbox or P4. The picture quality is not great, it’s only HD ready, but it’s definitely usable. If this is your first projector, then you’re good to go. The built in speaker is loud as well, but gets distorted on the loudest volume. I would definitely recommend this if you have a dark room to put it in and a projector screen to use it with. “Optoma has now given to the projector ML330 an Android menu and some interesting interfaces, and quickly the big image for smartphones and tablets will become a breeze...4/5 Stars...Top class!" "It's super compact and smart because it has Andriod OS built-in so you can stream movie, TV, games, music, all without connecting an external device. I think this is a really slick projector, with the convenience of all the apps baked right in. It's just as great for a presentation as it is for a pop-up home theatre." "A smallscale projector with more tricks up its sleeve that you might expect." "I was impressed with just how bright and dynamic pictures from the ML330 can be." "If you want a well-specified and affordable mini-PJ you can take on the road or into the bedroom the ML330 deserves a look." “Whether an Android-media player or a large screen machine for Smartphone, the Optoma ML330 is absolutely amazing with great image quality and compatibility with mobile usage"
"Very sharp display on up to 120 inches, Optoma manufacture powerful projectors and great images are certainly displayed. For its size the projector has a phenomenal light output". "The body of the projector is small enough to fit in a purse or cargo pants pocket, and at one pound it's equally easy to carry around. Whether you've been looking to kick your weekly movie night up a few notches, or don't mind trading off some resolution for a larger size, the IntelliGO [ML330] is a good choice."